than it is to punish them at this late date. We are not done learning from these atrocities. I am hopeful that my new novel will contribute to that understanding. With time running out, a new generation of criminal prosecutors in Germany has opened dozens of fresh investigations into long-dormant cases of death-camp guards suspected of culpable roles in the Nazi genocide machine. Men and women left to live in freedom for decades after World War II are finally being scrutinized for their work in the camps, with modern technology like 3-D visualizations of the camps being used to contradict their claims that they never were able to witness the ghastly routines of the Holocaust. While there is sympathy among some Germans for the suspects because of their advanced ages, it is impressive that prosecutors known as the “grandchildren generation” are pursuing a better-late-than-never policy in opening the largest number of cases at once since the end of the war, as Melissa Eddy reported in The Times. Key to this effort was a 2011 decision by a Munich court in the conviction of John Demjanjuk that struck down a precedent from the 1960s requiring that evidence link a suspect to a specific killing. The court found that anyone like Demjanjuk who worked at Sobibor, one of the smaller death camps, had to have known and been an accessory to the murder of thousands while he was a guard there. Federal prosecutors have recommended that 11 of Germany’s 16 states pursue charges against 30 former guards. Multiple investigations are underway into the roles played by suspects who worked at the sprawling Auschwitz-Birkenau camp, the death site where more than one million Jews and other victims were murdered. The new cases will not be easy, for prosecutors still must prove what suspects knew about the daily, deadly labor. But the German effort is important for pursuing justice delayed and for filling out the record of a monstrous time that is fast receding into history. STUTTGART, Germany — After years of relative inaction, German prosecutors have opened dozens of fresh investigations of men and women suspected of having served as Nazi death camp guards, racing against the clock to bring the aging suspects to justice. Not since the end of World War II have so many cases been initiated at once. The surge of cases is being driven by a new generation of prosecutors — the “grandchildren generation,” as they are known here — who bring a less conflicted view of culpability to crimes committed during the war and who were given a legal opening with the 2011 conviction of John Demjanjuk, a former guard at the Sobibor death camp who spent years as an Ohio autoworker. The prosecutors are now applying modern advances to historical crimes, like three-dimensional virtual models of camps to demonstrate what guards would have been able to see from their posts, as well as spreadsheets and databases to glean critical evidence from reams of Nazi archival material. Since March alone, prosecutors from Stuttgart to Schwerin and Hamburg to Frankfurt have opened inquiries against men and women suspected of playing a role in the functioning of the Auschwitz-Birkenau camp, cases that could eventually lead to charges of complicity in the murder of tens of thousands of the more than one million Jews and others who perished there. The youngest of the suspects are well into their 80s and have lived freely in Germany for decades. Among them is a woman from Hamburg who is in her 90s and served as a guard at Auschwitz-Birkenau from September to October 1944, prosecutors say. Another is a 93-year-old man who worked as a paramedic at the camp in 1944. He was arrested in March after a search of his home in the northern state of Mecklenburg-Western Pomerania. The advanced age of the often frail suspects has brought forth sympathy among some in Germany, raising questions of whether it is just to pursue prosecutions now after having let them live out so many years in peace. But the prevailing sentiment in the German news media and public discussions is that Nazi-era crimes are better pursued late than never. 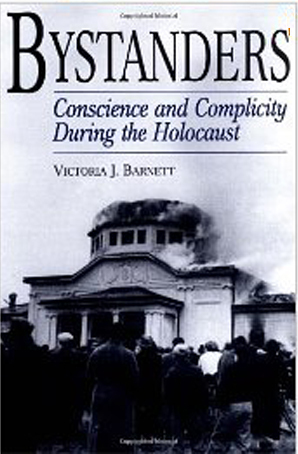 “It is often asserted, and is true, and has been taken for granted as something that was unavoidable, that most perpetrators of the Holocaust were never held accountable for their crimes or even called before a court,” said Paul A. Shapiro, director of the Mandel Center for Advanced Holocaust Studies at the United States Holocaust Memorial Museum in Washington. The crucial precedent was provided by the Demjanjuk case, in which a Munich state court convicted the former death camp guard of accessory to the murder of all 28,060 people who died during the time he served there. That ruling overturned a precedent that had required evidence linking suspects to a specific killing, which had stood since 1969. The judge further found that it was impossible for anyone who worked at Sobibor, a relatively small camp, not to be considered a part of the Nazis’ machinery of mass murder. Since then, German federal prosecutors tasked with investigating Nazi war crimes have reopened dozens of files on former guards whose whereabouts had long been known to the authorities. The cases steadily trickled through Germany’s decentralized justice system until September, when the federal prosecutors recommendedthat the authorities in 11 of Germany’s 16 states pursue charges against 30 former guards. But while the Demjanjuk ruling removed the burden of linking guards to a specific death, prosecutors continue to face the burden of proving what suspects knew about the industrial-scale killing taking place around them. 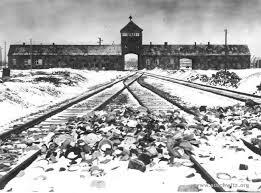 They started with Auschwitz-Birkenau, where proving what any one guard knew about the killings may be legally more difficult than in Mr. Demjanjuk’s case because Auschwitz was far larger than Sobibor. The one obstacle Mr. Dietrich could not overcome, however, was the advanced age of the defendant, who was ruled to have the onset of dementia, rendering him incapable of following the “difficult individual charges” against him. On Feb. 28, the state court in the German city of Ellwangen dismissed the case. The ruling was a measure of the closing window of time prosecutors face to pursue their cases against the aging suspects. While Mr. Dietrich will never know if his model would have helped convict Mr. Lipschis, his techniques are serving as a blueprint for other prosecutors across the country who are sharing information, swapping notes and trading tips on strategy. “Of course we exchange ideas and try to help and support each other,” said Stefan Urbanek, 52, a prosecutor in Schwerin, where the 93-year-old paramedic was arrested on suspicion of accessory to the murders of more than 1,700 people at Auschwitz. Such an approach reflects the generational shift in Germany’s justice system, which for decades seemed unwilling to seek new ways to prosecute former guards, said Nathan Stoltzfus, a professor of history at Florida State University. “It shows what you can do with a concerted effort to get a conviction,” he said. 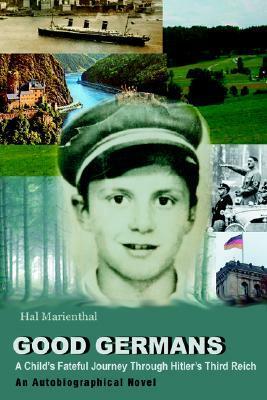 FROM THE FLY-LEAF … Melita Maschmann’s memoir (publ 1964) … without self-exculpation or self-pity … she changed from an ordinary 15 year old schoolgirl in 1933 into a high-ranking member of the Nazi elite … blindly dedicated … she remained loyal to National Socialism against all protests of truth and justice … imbued with the latent antisemitism of her parents’ generation … when she saw Jews, Poles and others suffer she switched off her feelings … because to think for oneself or to make moral judgments was immoral in the time of Germany’s need. 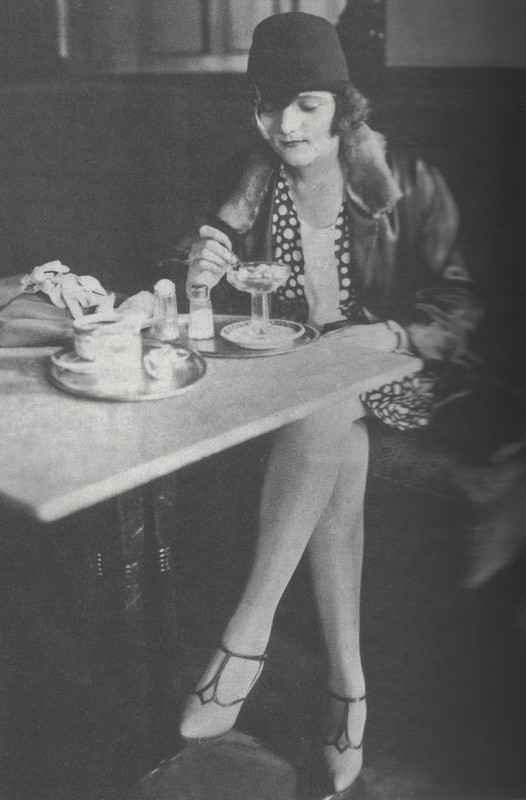 BEFORE READING THE BOOK … I am going to hate this woman … but will certainly understand more about the sickness that so many ordinary Germans welcomed and allowed to control their lives. 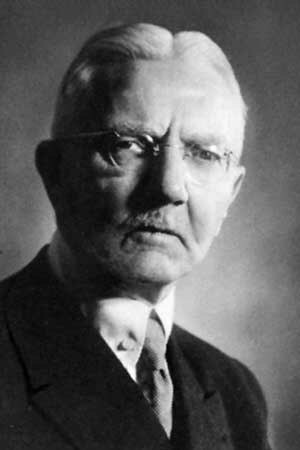 … I never allowed any of my experiences to prompt me to come to grips with the so-called “Jewish Question” for myself … my antisemitic attitude seemed to me to be a natural part of my National Socialist outlook … basically the problem did not interest me … LMW: it is thus vital to understand why antisemitism was so natural for Germans. My own view is that it was largely the centuries-long persecution and denigration of Jews by the Catholic and Lutheran churches. … on the news of ‘Bloody Sunday’ at Bromberg … the German press reported that 60,000 German nationals had been murdered in an appallingly savage manner … my clear recollection was that we had invaded Poland after the news of Bloody Sunday had reached Berlin … in point of fact the events happened in reverse order … but my version, which I held until a few months ago, was much better for easing our political conscience. … we had no idea there was evidence at Nuremberg that Hitler really had murdered millions of people … and (in 1946) we never thought to ask: what if the American allegations about the concentration camps are true after all? I have read about 80 pages. It is a poignant, illuminating memoir written as a novel. 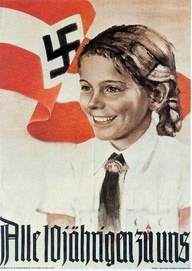 A powerful description of the early Nazi years (up to 1936) seen mainly through the eyes of a young boy. Marienthal was adopted by a Chicago couple in 1936 and went on to a brilliant academic and film career in the U.S. I have put the book aside but will return. For now, it is a few years ahead of my timeline in researching and writing CHOOSING HITLER. It is likely that no one else would be as excited about this book as I was. 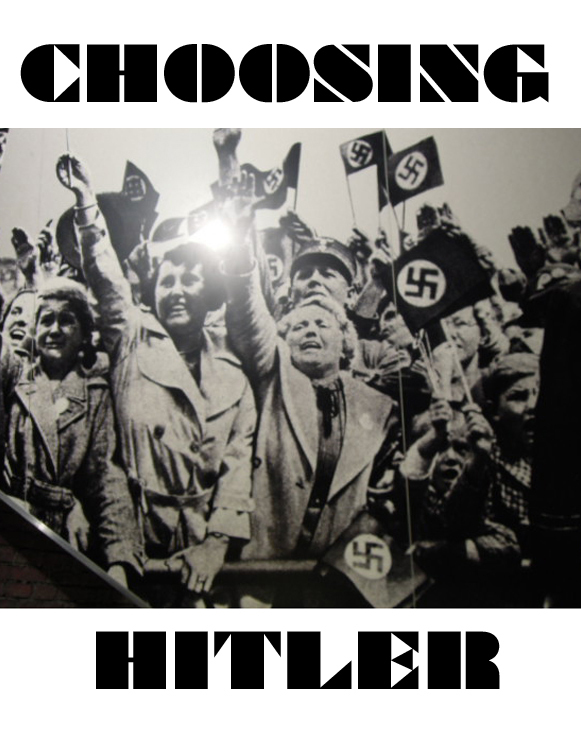 I have long had in mind having the major German character in my novel-in-progress (tentatively titled CHOOSING HITLER) make his career in the German Railway. 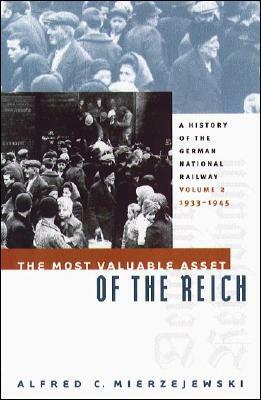 This book provides incredibly relevant detail for that purpose, including … the educational background he would need … the sequence of positions he might hold … the relationship between the German Railway, the Reichswehr, the SS, and Hitler … the role of the Railway in support of Hitler’s wars … and the role in transporting Jews to the ovens. What did railway officials and workers know about the ongoing Holocaust? Plenty. What did they care about the Jews being taken to murder? Most of them, not at all. 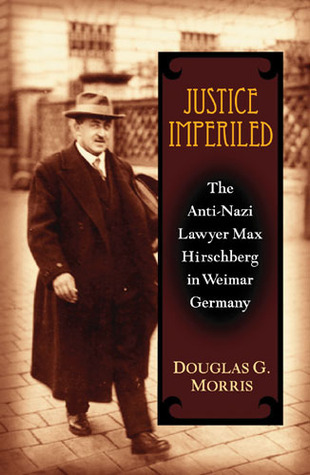 Fascinating detail of the major cases of a Jewish lawyer who fought for justice in Munich during the Weimar years. Max Hirschberg was the premier courtroom lawyer in Munich during the Weimar Republic, representing Munich’s Social Democratic Party in its most important political trials. He also took on numerous cases where the right-leaning criminal justice system had resulted in what he saw as a miscarriage of justice. Right at the top of Hitler’s list, Hirschberg was arrested by the Nazis in the early morning hours after the Reichstag fire in February 1933. He was held in “protective custody” for over 5 months and then inexplicably released. He fled to Switzerland, then to America, and lived into the 1960s. The lingering feeling I get from this book is the critical importance to a civilized society of the rule of law, how impossible life must be when this no longer applies, and how much we should appreciate those who fight to maintain it. I have written about the perversion of the rule of law in my novels A Good Conviction and Case Closed: … why the FBI failed to solve the 2001 anthrax case. And of course Hirschberg’s cases raise yet again the question of how educated Germans could have failed to see what they were getting with Hitler, or if they knew, why they were willing to make the bargain. I am thinking of imagining and writing a dinner conversation between Max Hirschberg and Munich’s Cardinal Michael von Faulhaber, in 1930, where these issues and questions will be discussed. Faulhaber had been outspoken against antisemitism in the 1920s, became far less so when the position of the Catholic Church became one of accommodation to Hitler in the 1930s, then again adamant in the Church’s successful campaign against Nazi euthanasia in the early 1940s … while never mentioning the mass murder of Jews of which he surely knew. I think Faulhaber’s evolving positions are fertile material for my novel-in-progress, tentatively titled CHOOSING HITLER. But … my wife tells me it is not possible that the Cardinal would come to dinner at a private home, especially that of a Jew. I’ll have to find another way. I am a professor of history at Brandeis University, specializing in Holocaust studies. 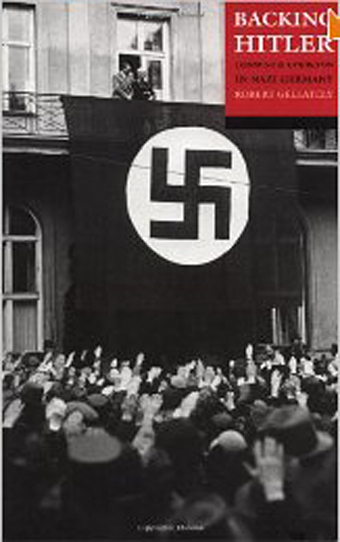 Despite the many books written on this subject, there is an aspect of the Hitler years to which I believe more attention could usefully be given. Specifically, I would like to explore why Germans supported Hitler at various stages in his career and what these supporters felt when they realized what Hitler was doing to the Jews . The reason I come to you is that my father was the U.S. attorney in charge of prosecuting your case at Nuremberg. The surprising testimony of Anna Gorski at your trial suggests that your personal experience and feelings may provide very useful insight into both of the above questions. I would like to come to Munich and meet with you as soon as possible. Please let me know if you are open to such a meeting.